The Global Volcanism Program has no activity reports for Moti. The Global Volcanism Program has no Weekly Reports available for Moti. The Global Volcanism Program has no Bulletin Reports available for Moti. The 5-km-wide island of Moti, also known as Motir, is part of a roughly N-S-trending chain of islands off the western coast of Halmahera Island. It is located north of Makian volcano and south of Mare and Tidore islands, and is surrounded by coral reefs. The truncated, conical island contains a crater on its SSW side. Moti was mapped as Holocene in age by Apandi and Sudana (1980). An insignificant eruption was reported in 1774 or shorter before, but Gogarten (1918) indicated that this event was confused with the October 1773 eruption of nearby Gamalama, which could have dropped ash on Moti. Apandi T, Sudana D, 1980. Geologic map of the Ternate quadrangle, north Maluku. Geol Res Devel Centre Indonesia, 1:250,000 scale map and 9 p text. Morris J D, Jezek P A, Hart S R, Gill J B, 1983. The Halmahera Island arc, Molucca Sea collision zone, Indonesia: a geochemical survey. In: Hayes D E (ed) The Tectonic and Geologic Evolution of Southeast Asia Seas and Islands, part 2, Amer Geophys Union, Geophys Monogr, 27: 373-387. There is no Deformation History data available for Moti. There is no Emissions History data available for Moti. Clouds cap the top of the 5-km-wide island of Moti (left-center), also known as Motir. This island is located north of Makian (bottom-left) and south of Mare (top-left) in this NASA Landsat image. 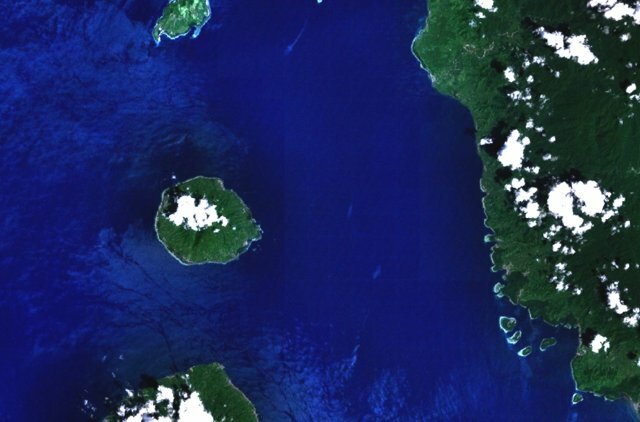 Moti lies along a N-S-trending chain of islands off the western coast of Halmahera Island (right). The truncated, conical island of Moti is surrounded by coral reefs, and contains a crater on its SSW side. The Global Volcanism Program has no maps available for Moti. There are no samples for Moti in the Smithsonian's NMNH Department of Mineral Sciences Rock and Ore collection. Large Eruptions of Moti Information about large Quaternary eruptions (VEI >= 4) is cataloged in the Large Magnitude Explosive Volcanic Eruptions (LaMEVE) database of the Volcano Global Risk Identification and Analysis Project (VOGRIPA).